The best way to explore this city is to get lost in the labyrinth of its cobbled side streets and take time to indulge in its century-old castles, magnificent churches, charming squares, and rust-red-roofed houses. 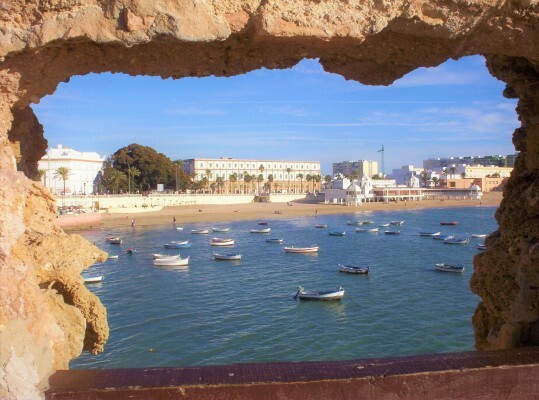 Listen to the Atlantic waves crashing against medieval stone walls, discover the city’s authentic bars and taverns and enjoy the sunny days at the Cádiz beach. 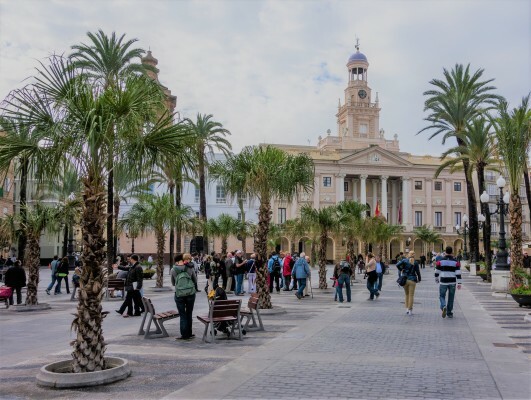 The list of free things to do in Cadiz is pretty long – whether you decide to take a stroll through the Old City’s picturesque narrow alleys, join a free walking tour, relax on one of the beautiful plazas, go sightseeing on your own, or simply rest sunbathing on the city’s beaches, you will love your stay in Cadiz, Andalusia. Here are our top 7 places to visit in Cadiz, which are free to explore. The city is known for its Torre Tavira, an observation tower with 129 watchtowers which were used for spotting ships. Today, this is the highest point in the Old Cadiz and a perfect spot to enjoy the stunning view of the city and the ocean below. 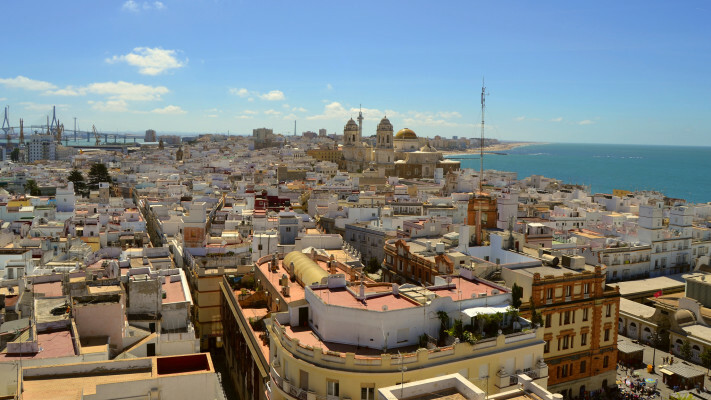 Ascending to the watchtowers is definitely one of the best free things to do in Cádiz. 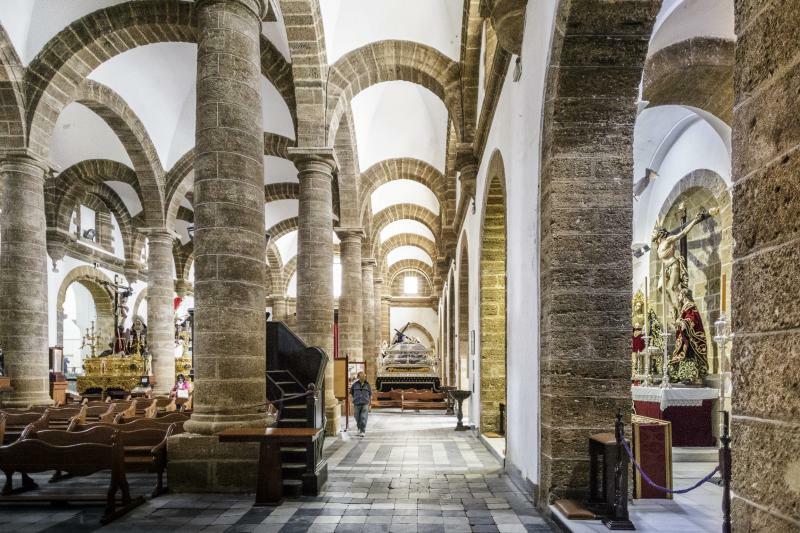 If you're an architecture lover, make sure to visit Catedral de Cádiz on Campo del Sur Avenue, built between 1722 and 1838. There is an evident mix of the Baroque and the neoclassical style since the cathedral took more than 100 years to complete. You’ll also notice the beautiful towers that were the last elements to be added in the 19th century. However, the highlight of the church is a dome of golden tiles that contributes to the cathedral’s impressive appearance. In addition, the top of the cathedral’s tower offers spectacular views over the city below. 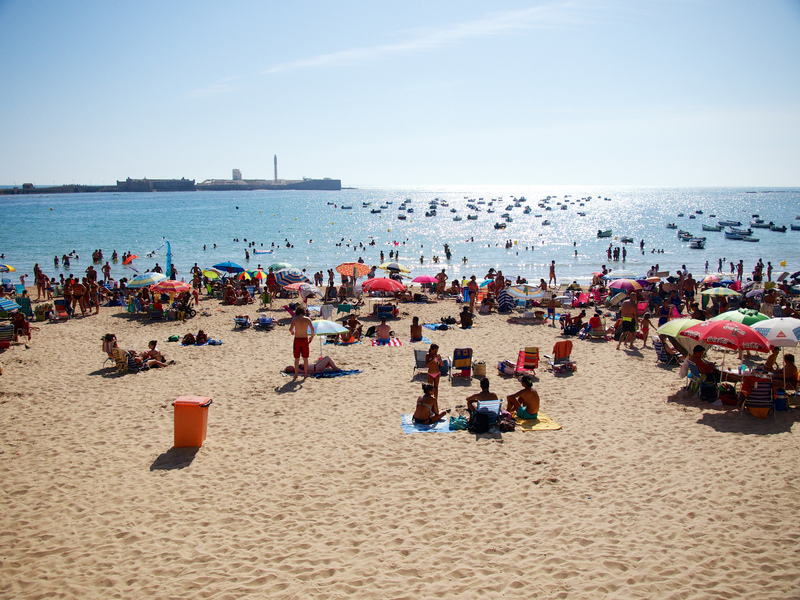 This is one of our favourite places to visit in Cádiz. The Plaza of San Juan de Dios is located in the area of Barrio del Pópulo, the medieval hub of Cádiz. It is the city’s major square and a great place to start your daily walking tour and city exploration. The beautiful San Juan de Dios square has served as the administrative, commercial, and communal centre since the 16th century. Situated close to the harbour, this plaza is filled with fountains, bars, restaurants, and palm trees. At the end of the square, City Hall and the Church of San Juan De Dios are waiting for you to explore them. In this astonishing neighbourhood, you will also find 13th-century old arches: Arco de la Rosa, Arco del Pópulo, and Arco de los Blancos, that make an out-of-this-world spot for pictures. The remains of the Roman theatre of Cadiz were for centuries hidden under housing built up over time and discovered in 1980. It is believed that this theatre was built during the 1st century BC. It was the largest theatre ever built in the Roman empire and it could host around 20,000 spectators. The theatre is situated on a remote street, so make sure you don’t miss it during your Cádiz walking tour, as it is well worth visiting. The entrance is free. Spend a day on the charming La Caleta Beach (Playa de la Caleta). This is a very popular, picturesque sandy beach close to the Santa Catalina Castle. There is an ever-busy beach bar humming with chatter and laughter of the locals and tourists. The nearby harbour with small fishing boats and a striking old-style spa resort building make this beach a perfect spot for taking photographs. Located near La Caleta Beach, the beautiful Castillo de Santa Catalina is a 17th-century military fortress with panoramic views of the ocean. Nowadays it serves as an exhibition space for craft, art and educational workshops. In summer, the castle's ground hosts many concerts and other recreational activities. Entrance is free, so you can take amazing Instagram-worthy pictures here without spending a dime! Another great place to visit in Cádiz includes Iglesia de Santa Cruz, the oldest church in the city, located near the seaside. You’ll fall in love with the church’s rustic sanctuary and romantic domed roof. This church was built on the site of a former Muslim mosque in 1263 and it definitely deserves to be added to the list of free things to do in Cádiz. We also recommend to explore the city on two wheels – it is quite a unique experience! 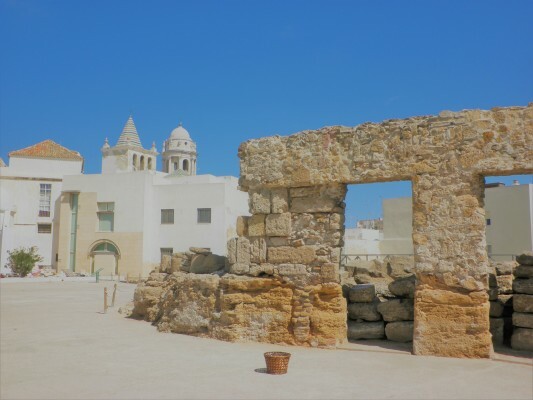 Join one of the bike tours and cycle through the narrow winding streets of the Old City and take a break on one of the beautiful large plazas. For a more contemporary feel, bike through the newest neighbourhoods of Cádiz, with wide avenues and modern buildings. Translated in English, Plaza de las Flores means “The Flower Square”. It’s a colourful spot that boasts a beautiful flower market and stalls selling a wide range of fresh plants. There are orange trees everywhere you look and a large number of cafes where you can enjoy delicious Andalusian specialities at the end of an exciting day. La Taperia De Columela. Address: Columela, 4. Freiduria Las Flores. Address: Plaza Topete, 4. La Marina. Address: Plaza Topete, 1. Stroll down the open-air outer part of Mercado Central de Cádiz (Central Market) and enjoy the atmosphere, colourful displays, and the stalls overflowing with delicious fruits, vegetables, drinks, fish, and other local specialities. Indulge in the magic atmosphere of the Cádiz market but note that the market closes early afternoon, so plan your visit in the morning. To get a true taste of Cádiz, try a grilled fish sandwich or a ‘tarantelo de atún’ at Dosbocados, stall n.107 in the Central Market. Enjoy a relaxing walk through Barrio de la Viña, a typical Spanish neighbourhood close to the sea. 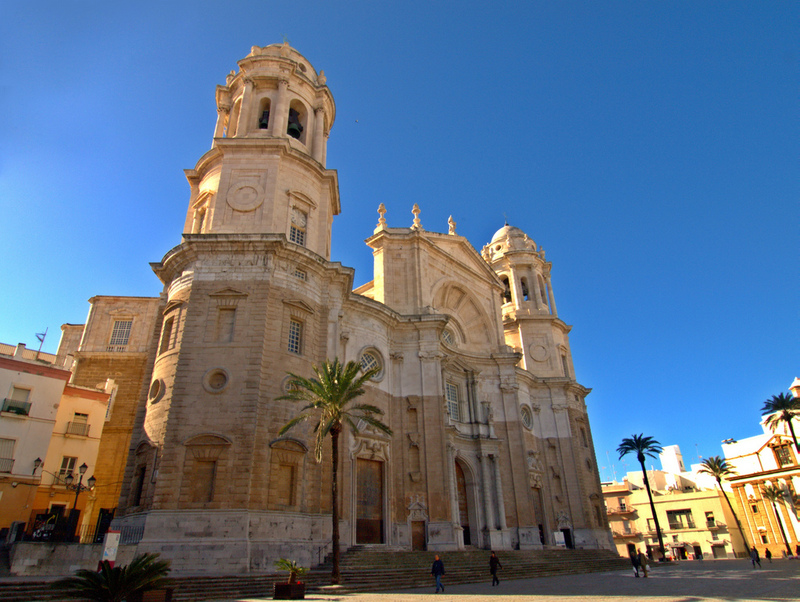 You will find yourself surrounded by remarkable old buildings, including the Cádiz Museum, and a peaceful atmosphere. In La Viña, you will discover many bars with terraces and a friendly, buzzing atmosphere. This is a small city quarter where you can enjoy your dinner with a glass of first-class wine in the sunset. Casa Manteca. Address: Corralón de los Carros, 66. La Punta del Sur. Address: Calle de San Felix, 11. Mini-Bar La Tabernita. Address: Virgen de La Palma, 32. As you can see, the oldest city in Western Europe, Cadiz is rich in cultural, historical, architectural, and culinary heritage. From well-preserved historical landmarks, antique quarters and lush gardens to long stripes of sandy beaches, this amazing coastal town in Andalusia will capture all your senses.